Now is the time to Upgrade your QNotes Office EMR Software, and order QNotes Office Version 6. This is our new Team Workflow Edition and includes lots of new features. First. we have added a new Scanning feature to the EMR, allowing you to scan Intake Forms, Reports, Drivers License and Insurance Cards into the patient's record. We have also re-designed the Patient Demographics and Case History screens. There are updates to not only the EMR, but the Scheduler, Easy Reports Templates and QDaySheets patient ledger. QNotes Office is the easiest EMR on the market, and the perfect way to safely store your patient notes and documents. PDQ Touch Notes™ is our flagship note system, a fully integrated and automated solution for Chiropractic, Podiatry and PT/Rehab. We are releasing and installing Version 6 through the end of the year. 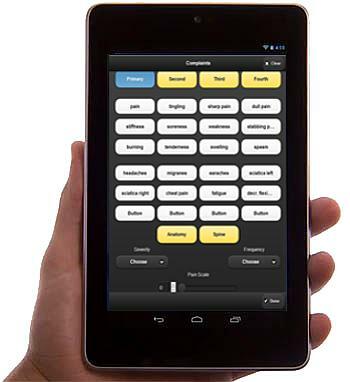 PDQ Touch works on many devices including Apple iPad and iPad Mini; Android devices such as the Samsung Galaxy; Microsoft Surface Pro; and Touchscreens, Laptops and Desktop Computers. PDQ links directly with QNotes Office EMR (V6) in real time, to help improve Documentation and your Office Workflow. New features include enhanced Document Profiles, improved Update Note (use your last note to make your new note), upgraded Type It (edit on the fly with Voice Dictation) and our commitment to PDQ's Take Home Mode (take PDQ anywhere, anytime)! We continue to find that most clients either do not do a successful backup, or their current method of backup is doomed to fail. You must protect your Patient Data! We are now offering the new Smart Backup™ with upgraded V6 software and new ultra-high capacity 8GB external drives. And to enhance HIPAA Compliance, we are now including FREE 1GB of Offsite Data Storage (Smart Backup, Version 6 and valid Service Plan is required). Now is the time to order or upgrade to the new Smart Backup. Come and See Quick Notes at a Seminar!